Why Can Paul Ryan Run for Vice President and Congress at the Same Time? 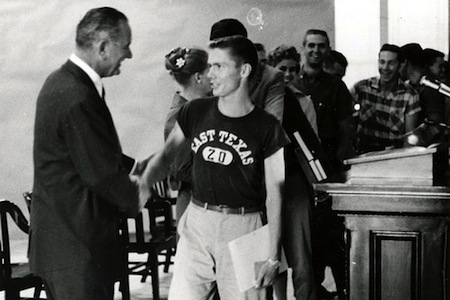 Lyndon Johnson greeting students at the East Texas Teachers College, his alma mater, in 1959. Credit: Texas A&M University. Paul Ryan is actually a candidate in two elections this year -- at the national level as Mitt Romney's running mate, at the local level as the incumbent congressman for Wisconsin's 1st congressional district. But under Wisconsin law, a candidate can only appear on the ballot once. So what gives? Like many great electoral innovations, this one can be traced back to Lyndon Baines Johnson. In 1959, fresh off a string of Democratic victories in the 1958 midterms, then-Senate majority leader Johnson was eyeing the presidency in 1960. But he was also up for re-election in the Senate and, for obvious reasons, did not wish to relinquish his seat. Texas law forbid a candidate from appearing twice on the ballot -- which was supremely ironic, considering that Texas Democrat and Speaker of the House John Nance Garner ran as FDR's running mate in 1932 while conducting a simultaneous campaign for his House seat (Garner got off on a technicality -- prior to 1945, ballots in Texas listed the names of the parties fielding presidential tickets, not the names of the candidates themselves). Johnson, using his numerous allies in the Texas statehouse, persuaded the state legislature to change the law in order to allow for his name to appear on the presidential ticket and the Senate simultaneously. When Johnson got the consolation prize of the vice-presidency in 1960, the so-called "LBJ Law" allowed him to thrash Republican challenger John Tower (who campaigned on the cheeky slogan "Double your pleasure, double your fun -- vote against Johnson two times, not one"). Subsequently, many states -- including Wisconsin -- then passed their own LBJ laws allowing for exceptions for presidential candidates. (Still other states, like Pennsylvania, allow for a candidate to run for two state offices simultaneously). Lloyd Bentsen, himself a Democratic senator from Texas, took advantage of the law in 1976 and 1988, as did Joe Lieberman with a similar Connecticut law in 2000 and Joe Biden with Delaware's LBJ law in 2008. Needless to say, LBJ laws haven't been popular with challengers. Lieberman was criticized in 2000 as "irresponsibly self-indulgent" for his multiple candidacies, and in Texas itself there have been rumblings over the years to repeal the law. None, however, have borne fruit, most likely because ambitious Texas politicians from both have a keen interest in keeping their electoral options open. And besides, John Tower captured LBJ's vacant Senate seat in a 1961 special election, which he held for twenty-four years. Paul Ryan's Democratic challenger, Rob Zerban, probably won't be so lucky -- though the suburban 1st district is considered to be moderate and went for Barack Obama in 2008, Ryan's congressional campaign has a four-to-one spending advantage.